Sports Illustrated ranked the top 100 players in the league and here’s where the boys from San Antonio came in. Sports Illustrated released their top 100 players in the NBA and there were five Spurs scattered throughout the list. Patty Mills, Danny Green, Pau Gasol, Lamarcus Aldridge, and Kawhi Leonard were all included. Mills is easy to overlook, what with future Hall of Famer Tony Parker running San Antonio’s show for years and 2016 first-round pick Dejounte Murray lining up as a potential point guard of the future. But the Australian marksman outplayed both last season, easily posting better individual advanced stats than Parker while also boasting a team-best +12 net rating. Although the 28-year-old Mills (9.5 PPG, 3.5 APG, 1.8 RPG) isn’t the best one-on-one creator or the most natural playmaker for others, he has fully settled in to San Antonio’s system, balancing his off-the-dribble shooting ability with improved offense initiation while seamlessly shifting between back-up and starting roles. Much of what he accomplishes on both ends owes to his frenetic energy; Mills keeps moving when he doesn’t have the ball and only needs a sliver of daylight to launch a catch-and-shoot three or sneak through a seam to the rim. Despite his lack of size, he’s an especially pesky and attentive on-ball defender too. San Antonio smartly rewarded him with a four-year, $50 million contract this summer, keeping him in place as a functional bridge between Parker and Murray (or whoever else comes next). Green plays in a way that draws a lot of attention to what he cannot do. He still has little recourse when opponents decide to run him off the three-point line, a predicament that pushes Green well out of his comfort zone. His perimeter shooting—Green’s (7.3 PPG, 3.3 RPG, 1.8 APG) most valuable contribution to an offense—is now in the midst of a two-year lull. Yet at minimum, Green is one of the most stifling defenders on the floor in every game he plays. Coaches can swing him freely to cover perimeter players of all kinds. Starting a defensive liability at point guard? Have Green corral opposing ones with his length instead. Need to preserve the energy of a ball-dominant creator? Cross-match Green to find the most advantageous matchup possible. The league has its share of defensive stoppers who undermine their own teams through offensive inability. Green is a cut above. Through cold streaks and all, he converted 38% of his three-pointers last season. This is a complicated juncture for Gasol, who is caught somewhere between starter and reserve. What matters most is that he’s still effective. Even at 37 years old, Gasol ​(12.4 PPG, 7.8 RPG, 2.3 APG) brings such healthy variety to an offense that he serves to build out its options. Most every team could benefit from an intermediary who sees the floor as well as Gasol does. It’s nice to have a shooter, a post player, and a roll man. It’s nicer still to have a big who can do all three while reading the floor as he goes. The Spurs, unsurprisingly, did as good a job of maximizing Gasol’s play as any team in recent years. Gasol is slow of foot but still contributed to the best defense in the league. The mechanisms of San Antonio’s offense empowered Gasol as a spot-up shooter, where he returned more points per spot-up possession than every big in the league save for Channing Frye. A lighter minutes load kept his production lean and consistent. Relying too much on Gasol can be limiting, but through the Spurs we saw the value of his role made right. Even his staunchest defenders must admit that Aldridge (17.3 PPG, 7.3 RPG, 1.2 BPG) didn’t hold up his end of the bargain with the Spurs last season. When Aldridge signed with San Antonio in 2015, he got it all: Max money, a chance to compete for titles, the opportunity to learn from Tim Duncan and play alongside Kawhi Leonard, and a lighter minutes and usage load. In exchange, Aldridge would be expected to be a star-level difference-maker on both ends and a go-to scoring option in the playoffs. Unfortunately, that’s not how 2016-17 played out for the 32-year-old power forward, whose PER hit its lowest level since 2010, whose rebounding rate hit its lowest level since 2009, and whose bread-and-butter mid-range shooting fell off by 5 percentage points from the previous season. Then, under the bright lights of his first career trip to the West finals, Aldridge struggled badly to reassert himself as a lead scoring option once Leonard was lost to injury. One could argue that Aldridge caught a little too much flak during the playoffs. After all, he’s an easy target given his contract number, aloof personality, and passive tendencies, he was facing a nightmare individual match-up with Draymond Green, and the Spurs were badly outmatched as a team against the Warriors. It’s also worth mentioning that Aldridge generally doesn’t receive enough credit for playing a major role on the NBA’s best defense. He allowed opponents to shoot just 49.3% shooting from within six feet last season, a rim-protection rate that compares favorably to the likes of Green and Rudy Gobert. 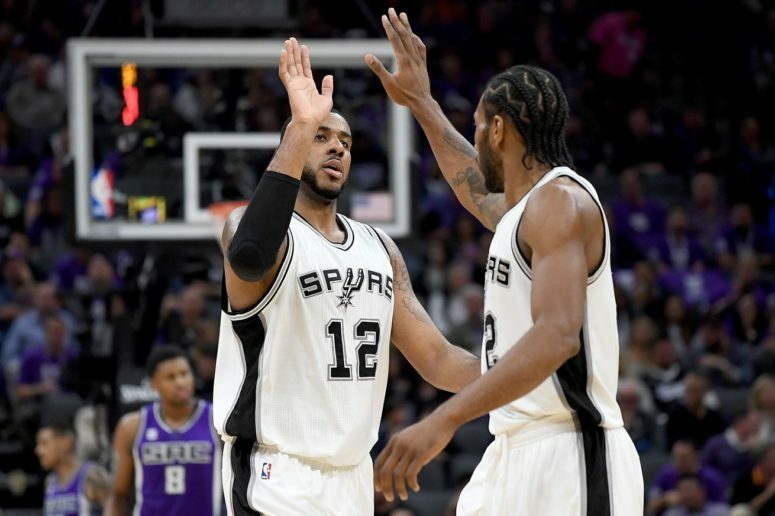 Still, the Spurs need more – and have every reason to expect more – from their five-time All-Star and No. 2 option next season. The possibilities with Kawhi are nearly endless. An expanding one-on-one game has made Leonard a handful—not only bigger and stronger, but also more skilled than most of the opponents he goes up against. Now that he’s hitting difficult jumpers with such regularity, Leonard’s defender doesn’t have much chance. The competing needs to both cut off Leonard’s path to the basket and crowd his space leaves them vulnerable to every move. Any mistake is punishable by score. Only these five Spurs were listed in the top 100. A notable omission from the list was Rudy Gay, who has been an elite scorer throughout his career and made SI’s list last year at 52. Of course, concerns about how he’ll play after his Achilles injury are the reason he wasn’t included. So, what do you think of SI’s ratings?